I was thinking about the importance of attribution today after reading Mike Glover’s take on the issue in his post on the coverage of Bin Laden‘s death and the “outrageous gullibility of the media in the wake of the Bin Laden incident“. It’s a thought-provoking piece of writing and well worth a read. (Also, incident is a great word, isn’t it? Covers everything from the reported death of the world’s most wanted man to a pub brawl). Anyway, attribution of information when constructing a story is vital; journalists tend to be the questioners of eye-witnesses, rather than eye-witnesses themselves. Sometimes we’re several links down the chain, and sometimes the report of several statements gets prosed into appearing as a presentation of stone facts. Tempering a slew of facts with acknowledgements that the information has come from a third party is helpful for readers, I suspect, but attribution with regards to content is an equally thorny issue. YouTube, Flickr, Vimeo, Twitpic, Facebook, Twitter, Storify, ManyEyes visualisations… just a tiny fraction of created content that lives on the internet, in the wild, that journalists can use to source or display information. But when it comes to reusing this work – the attribution – it’s so important to show genesis, or at some point the accusations of making a smash-n-grab raid on social networks will come. I’m probably a little obsessive about attribution, or showing source as a) I would hate to be accused of pillaging other people’s content and b) it’s easy to get permission or show original ownership. Things like a quick tweet exchange over the use of an image on Twitter, a link back to the video owner’s YouTube page, a link and a nod to the person who made the Storify you’ve embedded or the ManyEyes vis – so quick, so simple. So courteous. Flickr is a different matter; I wouldn’t use a Flickr photo on this blog without checking the Creative Commons licensing and giving clear attribution. Professionally, I wouldn’t consider a Flickr photo unless the owner had given me express permission (either by joining a group with a consent form – like the Liverpool Daily Post’s Flickr group has – or through direct contact. I had my own little attribution incident (see? 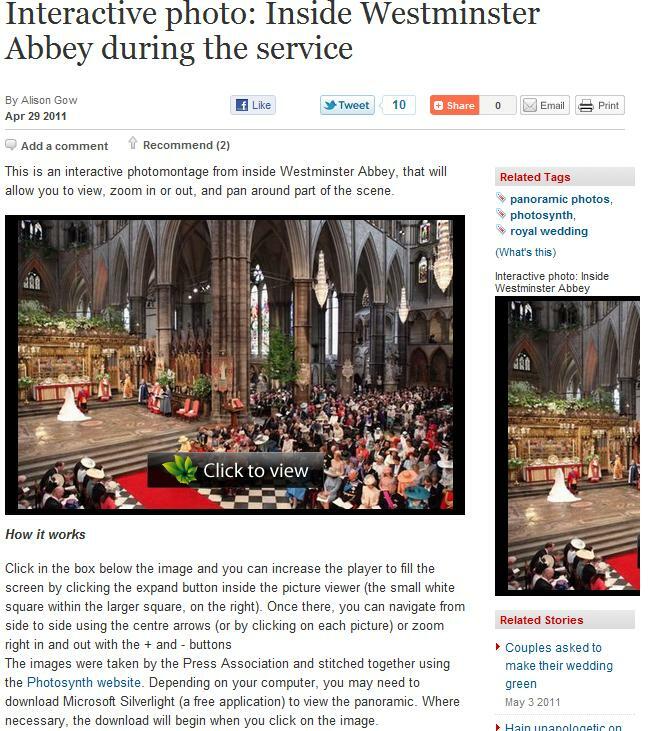 such a handy word) recently when I made a photo-montage for WalesOnline and it got reproduced, without attribution. They are actually the same one. I’d made a Photosynth for the website on Friday – it took a quite bit of time to find photos that would allow a sort-of panoramic (only 87% in the end) embedded it and went on with the next task of the day. 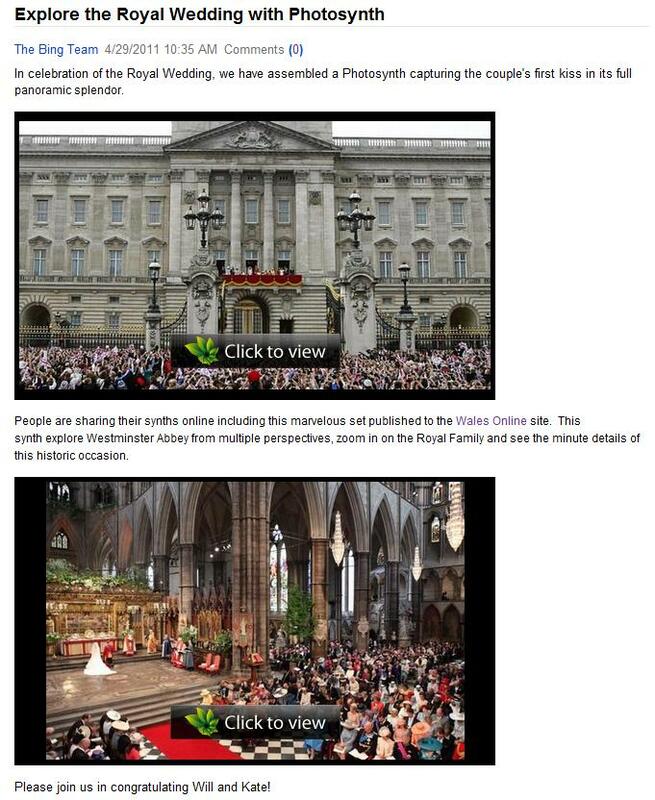 I’m not usually precious about this sort of thing; I enjoy using online tools like Photosynth and I support the idea of sharing content as widely as possible. Also, I could see Rafael’s point as Microsoft had allowed me to create that content in the first place. The downside was that WalesOnline was missing out on a pretty decent traffic opportunity. And that a really simple bit of attribution had been skipped. I’ve seen people nick other people’s tweeted jokes, and even pass off photos of their own on Flickr; this wasn’t in the same league but it still didn’t feel great. I worked hard on that thing, dammit! But it didn’t end there, as it turned out. 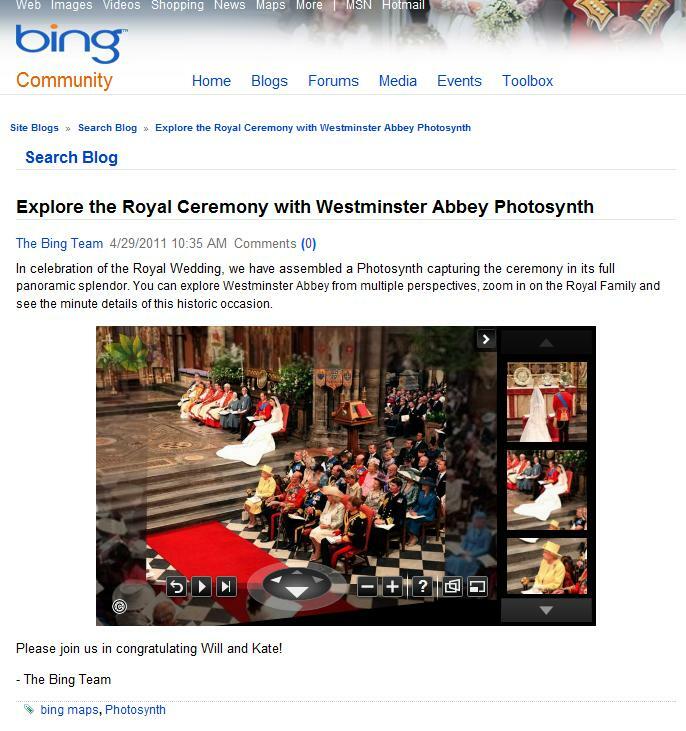 Tom took it up with Bing pr and look – a change of heart, thanks Bing. How cool is that? Almost as cool as this: someone I didn’t know took up cudgels on my behalf to see attribution was properly made. I thought that was really decent; how often have complete strangers stood up for your rights in real life? Nope, never happens. Except, sometimes it does.